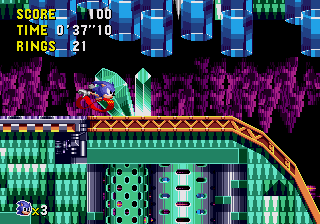 Quartz Quadrant is the fourth round in Sonic CD. Set in a semi-underground mine, you are almost completely surrounded by quartz and other minerals. Since this level is a bit more cramped than most other levels, it will be harder to get to the past. The bottom of the stage is mostly flat, though. This makes getting to the end and/or past easier. The gimmick in this level is being able to control the direction of conveyor belts. You can do this by running past a sign with an arrow on it. Each time you run past it, it will change which way the conveyor belts will go. The present is a large mining facility, with contraptions built in, such as conveyor belts. There is still a large amount of quartz to be mined, and some is just lying around. ...the future to become a wasteland of smoke-filled skies! Most of the land has become Robotnik's cities, and he still has his Badniks in the same position as before. If you manage to stop Robotnik's production of robots, the future will turn brighter. The mining has stopped, and the exposed crystals shimmer in the background. This page was last edited on 8 April 2018, at 09:40.